Gardening and Plant related Web site. I deal with pest control, growing unusual plants, gardening for cats and various experiments. Although it's faster to use tubers, Canna Lilies are easy to start from seeds. I moved and updated my Bird Photos, and pages on How to make Birdhouses. They were on my Boats (and other good stuff) Pages before. I got yet another link about food you should "never" feed to your cat. I decided to check if this was really true and what the evidence really was. Here is my result. Good for dogs too. List of what (really) you should not feed to your cat, and what is OK. I distilled fresh catnip oil to get essential oil to add to my insect repellent recipe. It was a success. My apparatus was simple stuff I had around the house. Not only are they delicious but they can be picked late in the fall or in spring. I found pink and yellow slime mould growing on a piece of firewood. This year I grew a cousin of the artichoke called Cardoons. It is popular in Mediterranean Cuisine. It grew very well but was annoying to prepare. It makes a nice ornamental plant though. I put together a simple irrigation system for my raised beds. Some drip and mostly soaker hose. It's been working really well and saves a lot of time and some money. I make charcoal for the garden and also for burning. I'm planning to try and cast aluminium after I launch my boat. This is how I make charcoal in the woodstove. Easy and safe. I made a light to help start seeds inside. It cost me about 20 dollars. I was looking at some of my summer photographs and decided to share a few of the spiders. Spiders are some of my favourite insects and they do a tremendous job keeping my garden pest free. 12 Plants that can feed you through the summer. If I could only plant 12 varieties of plants these would be my choice. This is as close to magic as it gets for me. Amazing. 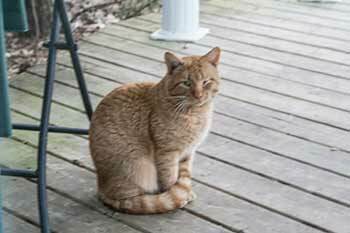 -Never feed these foods and medicines to cats. Good for dogs too. Hostas are forgiving of shade, easy going, and showy. Great plants to add texture and colour. With care they can be overwintered in pots in freezing weather. -My experiment growing ginseng from seed and from small roots was a great success. -Photos of pretty flowers from my back garden page 1. -Photos of pretty flowers from my back garden page 2. -Photos of pretty flowers from my back garden page 3. -Hypertufa is easily made into rock like flower pots, bird baths and garden ornaments. Here I made a hypertufa sunburst. A shade garden can be spectacular if the plants are suitable. Here is how I plant my shady fence row. Before I moved, all my plants lived in pots. Here is a collection that survive the Toronto Winter. -I recently moved and set up a new garden in Raised beds. So for a great success. -Report in August on the success of my raised beds. -Why are some seeds so hard to start? The requirements for seeds to grow can be quite finicky. Here are the most important requirements of seeds. -What is a hybrid plant, advantages and disadvantages. -5 Steps to an (almost) pest free garden without pesticides. 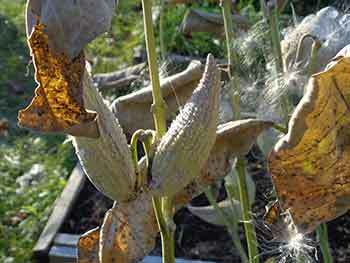 -Growing Milkweed to attract Monarch butterflies and bees. In fact it's a real butterfly magnet. -Okra Slime experiments, It's a very interesting material. -How to grow Jerusalem Artichoke, benefits of eating and nutrition values. 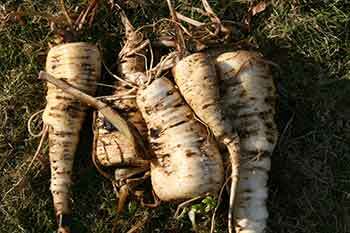 -How to grow Parsnips. Harvest when other plants are dead in late fall and early spring. -These 12 plants can produce most of the vegetables you will eat in a summer. -A lot of spiders make their home around my house. Here are a few. -Birds of winter, Eastern N.A. This helps pay for the website.